Distinctive features: A solidly engineered model from one of a number of U.S. companies that briefly entered the calculator market in the early 1970s. 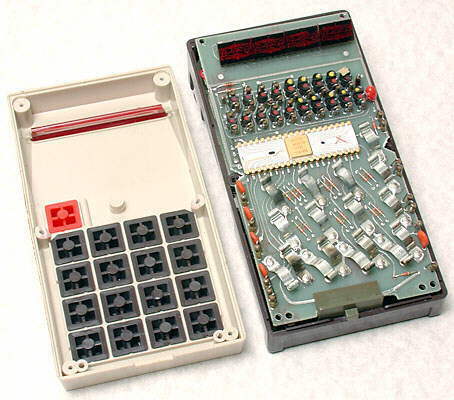 In the early 1970s the number of electronics components in a calculator had reduced but were still fairly costly. 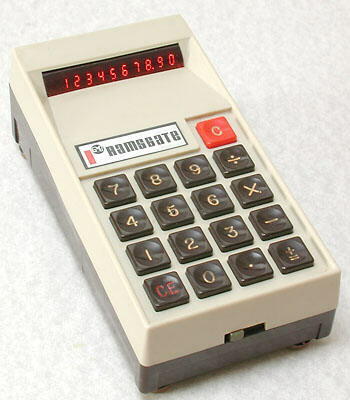 A number of small electronics companies, especially in the U.S.A., saw the opportunity of manufacturing calculators and making a profit. Ramsgate Inc. is one such company and, like many of them, little is known about it apart from a small number of models of calculator which turn up. The M-11 is the only known model from Ramsgate, and is very solidly made. With the ever reducing cost of the electronics components and the number of companies starting to mass-produce calculators, the selling price of calculators plummetted and the profits from manufacturing them dwindled. Most of these small companies dropped out of the calculator business after a year or two. To see more calculators from companies that only produced one or two models see the article "One Hit Wonders" in the Collecting Calculators section of this site. The Ramsgate M-11 is chunky and very solidly made, and shows signs that this was an early model from Ramsgate which was a low-volume manufacturer. 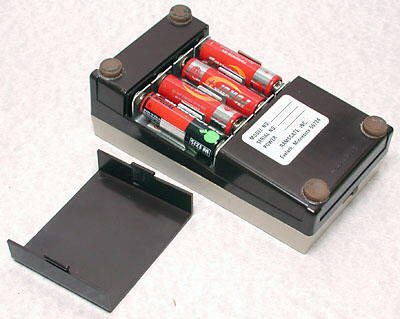 The photographs above show the battery holder of the M-11, which is one of most robustly made of any in a hand-held calculator and puts most others to shame. The case has been opened to reveal the circuit board and the very unusual keyboard. 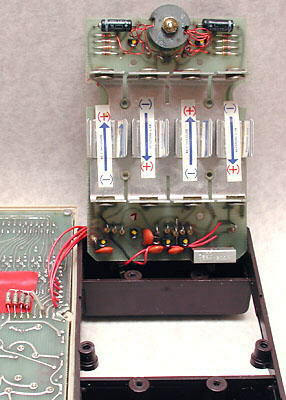 The contacts are just bent strips of metal which are pressed by the keypads onto stud contacts set in the circuit board. This example is very prone to contact bounce causing multiple numbers to be displayed from one key press - this is probably made worse by tarnishing over the years. 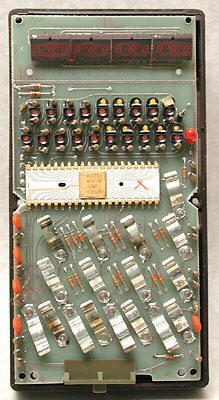 The circuit board of the M-11showing, from the bottom, the metal strips of the keyboard, the Mostek MK5010 integrated circuit, transistor drivers for the LED display, and four 3-digit LED modules. 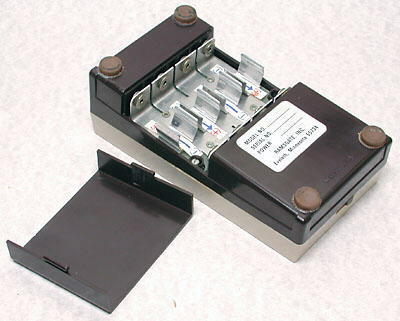 As well as the batteries, the base holds a circuit board with the clock oscillator.